RC Circuits, circuits containing a resistor, battery, switch, and capacitor in series, are the most confusing concepts to master. If you can master this concept easily, then you generally have no problems with this entire chapter. However, if you have difficulties, do not worry. This concept is rarely tested in the AP Physics B Exam (only twice over 10+ years). Also, even if it does show up, only the basic ideas are tested. See the AP Questions and Answers Section for detailed question relating to this idea. 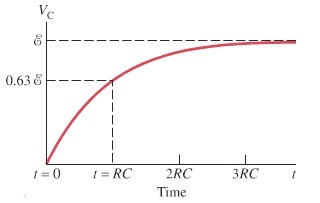 All RC circuits have one thing in common: a time constant (T). To calculate the time constant, just multiply the capacitance and resistance of the entire circuit together. In other words, T=RC. 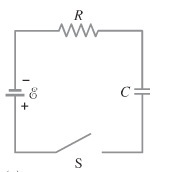 Though never so far tested in the Physics B Exam, it's also helpful to know the voltage vs. time graph for RC circuits. Note that the voltage reaches 63% of the battery's voltage when the circuit has been turned on for a period of one RC, or time constant. Also note that the voltage increases at a slower speed when time passes, and eventually it will reach the battery's voltage. One important notice: please be aware that this graphs only applies to circuits that have just been completely closed. If the switch was already closed and then "broke" or opened, the voltage vs. time graph would then look like an inverse proportionality curve, where the voltage decreases at a slower and slower rate when time passes.